There are times when something just does not feel right when you are driving down the road. 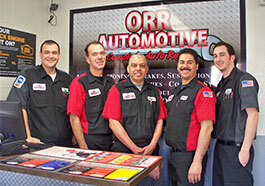 When that happens; it is time to give us a call at Orr Automotive. Maybe the ride is not as smooth as it used to be. Maybe your vehicle pulls to the left or the right. Perhaps your steering wheel is not straight up and down when your hands are positioned at 10 and 2. Are your tires making noises such as squealing when you are making a turn? Is your mpg off or are your tires wearing out faster than they used to? All of these issues can be attributed to alignment problems. Sometimes these problems are so subtle you can’t even feel them. Stop by so we can help your tires and fuel. Together we can make your car go the distance. Keeping your car on the road has never been easier! What is an Alignment Check? What does a Standard Alignment Include?